Baseball has always been in Caleb Wright’s life. He would play in school during the spring, play in summer league, attend fall practices and just throw in winter. 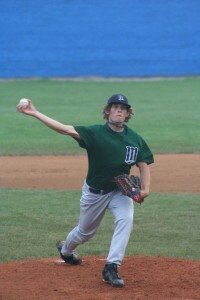 But his time to play collegiate baseball is coming to an end. Even though Wright has been with the Cougars for three years, the time hasn’t passed slowly for Wright. He still has his final season to go to enjoy and maybe reach a few last goals. Wright wants the team goal to be “to make it into postseason play, win the conference tournament and try to make it to the World Series,” he said. Wright likes baseball for many reasons. “I really like the pressure and competing,” Wright said. “It’s such a unique and awesome feeling when you’re facing a hitter, and it’s just you versus them. The enjoyment extends to hanging out with teammates. “Some of the best memories I have while playing have been in the dugout or at practice playing practical jokes, or joking around with each other,” Wright said. When game day comes, Wright knows what his strengths are and what he needs to work on. Wright’s teammate Darren Athey appreciates playing ball with Wright. “Caleb is an encouraging teammate who is always working hard on his own game, but also always trying to help out his teammates as well,” Athey said. “Caleb’s impact to the team is important because he is a strong starting pitcher. We know that every time he steps onto the mound that we have a good shot at winning. Wright’s parents made the biggest impact on him, he said. Wright will also continue to play baseball on whatever level he can. Before he leaves the field at season’s end, he has some advice to pass along. Besides advice, he hopes to have changed his team for the better. “I would like my lasting impact to be on the development of our pitching staff by helping them improve their skills,” Wright said.